SKU: Dart Solo 6RB-2050 Bare Eco-Forward 6 oz. 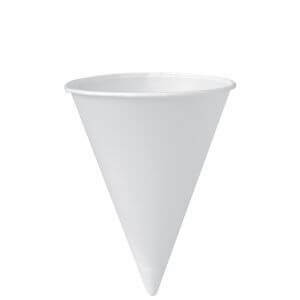 White Rolled Rim Paper Cone Cup with Poly Bag Packaging - 5000/Case. Categories: DART, PAPER CONE CUPS / FRENCH FRY CUPS, PAPER CONE CUPS / FRENCH FRY CUPS-1, PAPER CUPS / LIDS, PAPER CUPS / LIDS-1, SUSTAINABLE CUPS. Ideal Single-Use Product That’s Good For Sanitation And Is Eco-Forward® Solo Foodservice is committed to making a positive difference to the environment and offers a full portfolio of Eco-Forward® products with various environmental attributes. 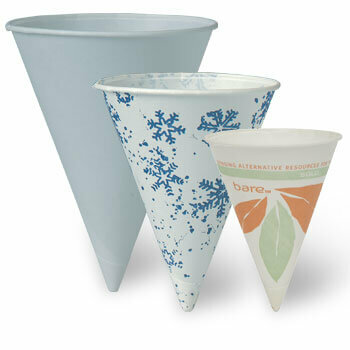 Cone cups help keep things tidy around the water cooler because they cannot be set down and left behind. There are also several packing options available: caddy bag, caddy box, chipboard box and plastic sleeve inners. Sustainable Features: Bare® by Solo® Cedar Grove compost facility accepted Compostable in a commercial composting facility which may not exist in your community. Not suitable for backyard composting. Eco-Forward® Made with 70% plant-based renewable resources Meets the ASTM standard D6868 for compostability Solo represents that our Solo brand paper products are made from paper purchased from manufacturers that at a minimum have either Forest Stewardship Council (FSC) or Sustainable Forestry Initiative (SFI) certified fiber sourcing.